This latest survey of Iraqi opinion is a reminder to policy-makers in Washington, London and Baghdad of the strength of opposition to the presence of foreign troops in Iraq. Although the Bush administration is more interested in the results of its troop surge than the findings of this survey, it will take note perhaps of one figure: the number of Iraqis who approve of attacks on coalition troops has risen from 17% in a similar survey three years ago to 51% now. 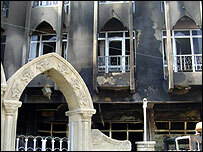 That level of hostility is what lies behind the unrest and what has led to the US reinforcement in Baghdad. However, the administration might take some heart from the finding that people are not actually calling in overwhelming numbers for an immediate withdrawal. Those who want foreign troops to go immediately are still in a minority, though a growing one (35% compared with 26% in 2005). Most want the Americans to (somehow) restore security first. And most Iraqis disapprove (by 88% to 12%) of attacks on Iraqi security forces. The figures therefore do lend some support for the US belief that there is still a window open for stabilisation. And Iraqis are still showing resilience, with substantial support for democracy (though down from 57% in 2005 to 43% now). However, many are interested in a "strong leader", appointed "for life" (34% compared to 26% last time). And there is still support for a unified Iraq, though with the Shias wanting far more regional devolution. More worrying is the drop in optimism (from 64% in 2005 to 45% now), probably to be expected, and the sharp divisions between Shia and Sunnis. Sunnis are far more alienated, pessimistic and hostile. The figures are not a shock of course but they do show why the Americans are pressing the Iraqi government to take steps towards reconciliation. Toby Dodge, Reader in International Politics at London University, believes the survey is useful. "Given the restrictions on reporting in Iraq, it is invaluable to have a scientific, rigorous and detailed account of what Iraqis are thinking across the country," he said. "The counter-intuitive optimism last time can be explained by the fact that it was an election year. That optimism has collapsed because the hoped-for results were not delivered but the pessimism is mildly expressed. Iraqis are accepting that it won't get much better any time soon." Leading Shia politician Dr Humam Hamada, chairman of the Iraqi parliament's foreign affairs committee, has said he thinks the poll findings are out of date. "Since this poll was taken the new security plan has been put into place and there is now hope not pessimism," he said on a visit to London as part of a committee delegation. "The death rates are down and there are indications that the people recognise that there is a strong government and law and order. They are coming forward with information. "There has been tribal co-operation against the al Qaeda terrorists, who have fabricated this war. This shows that the Iraqi people can co-exist. In addition, we have taken steps towards reconciliation." However, a Sunni member of the delegation, Professor Selman al-Jumpily, indicated that he did not think the insurgency had been "fabricated". He said he agreed with the poll findings. "There is a popular rejection of foreign forces," he said. "This is maybe more intense in the Sunni areas. I think the percentage may be correct. The rejection is both military and political. In political circles there is the desire for a free Iraq. "We remember that Iraq was given its independence in 1932 and the same feeling of dignity is still with us." The members of the delegation were united in their view that they did not want Iraq to split up - reflecting the poll findings. Despite their unease about the presence of the foreign troops, they did not call for their withdrawal or even a timetable for departure. "We need troops at key points and if more foreign troops are needed then they should be sent," Dr Hamoudi said. "Any withdrawal is in the hands of the Iraqi government. It will be decided. A timetable for withdrawal is not in the interests of the Iraqi people." The findings are unlikely to have much effect on the political debate in Washington. That is determined by the success or otherwise of the security campaign. According to Toby Dodge, who gave evidence to the Senate Foreign Relations Committee in January, the mood there is "heading towards cut-and-run." "The elite in Washington is deeply pessimistic and only Bush and his colleagues are holding on," he said. However, the Bush administration might still be encouraged by some of the findings - on Iraqi unity, on faith in democracy - though the verdict on the latest security operation, with its "surge" of US forces into Baghdad, remains out. The opposition Democrats in the US Senate, by contrast, have tried and failed to pass legislation that would force President Bush to set a timetable for leaving Iraq. 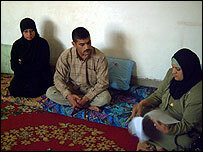 "You must come to Iraq. It will be the centre of peace and prosperity in the region. It will be a focus for understanding not struggle."